Conjunctival amyloidosis is thought to be the manifestation of a local immunologic disorder, and affected patients rarely have systemic amyloidosis. This is a rare case report of conjunctival amyloidosis presenting as bilateral ptosis and entropion of the left lower lid. A 35-year-old male presented to us with progressive drooping of the upper lids in both eyes since three years. It was associated with discomfort and a pricking sensation in the left eye. 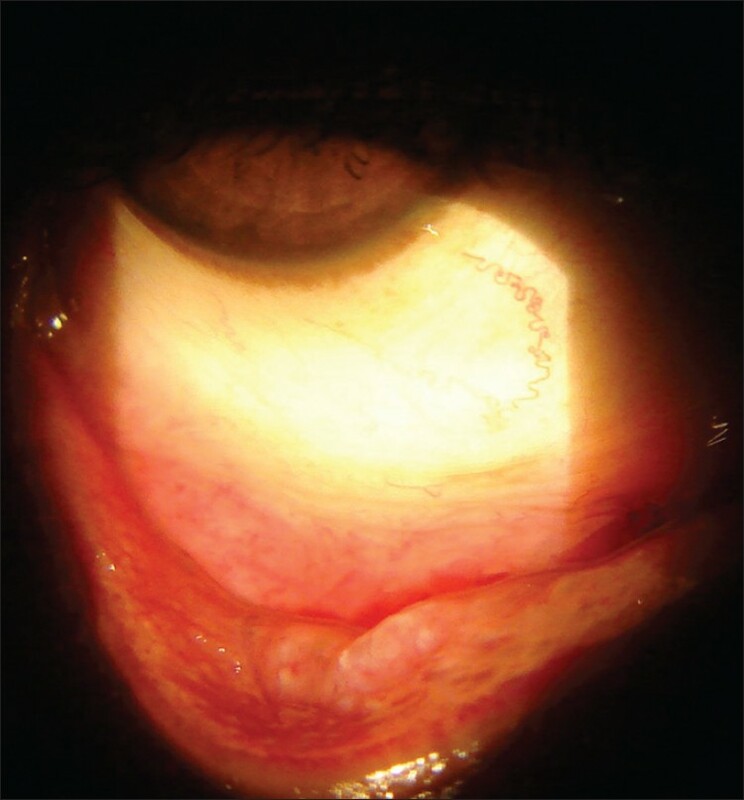 Detailed history did not reveal any preceding ocular trauma or other chronic ophthalmic complaint. On examination, the best corrected visual acuity was 20/20 both eyes. The patient had bilateral ptosis with a palpebral aperture height of 6 mm on both sides. The upper lids on either side were bulky with thickened tarsal plate; the levator function was 10 mm on both sides. The left lower lid had entropion of grade 3. There was the presence of multiple, firm, waxy, polypoid subconjunctival lesions [Figure 1]. Biopsy of the conjunctival and tarsal plates revealed acellular, eosinophilic, hyaline material beneath the epithelium. On Congo red staining, the material stained brick red color and showed a green birefringence with polarized light [Figure 2]. Examination of the extraocular muscles, eyeball, retrobulbar area, and optic nerve was normal. The patient underwent further diagnostic evaluation. The workup included complete blood count, urine analysis, urine protein electrophoresis, and ultrasound of the abdomen. All reports were within normal limits, ruling out systemic disease. 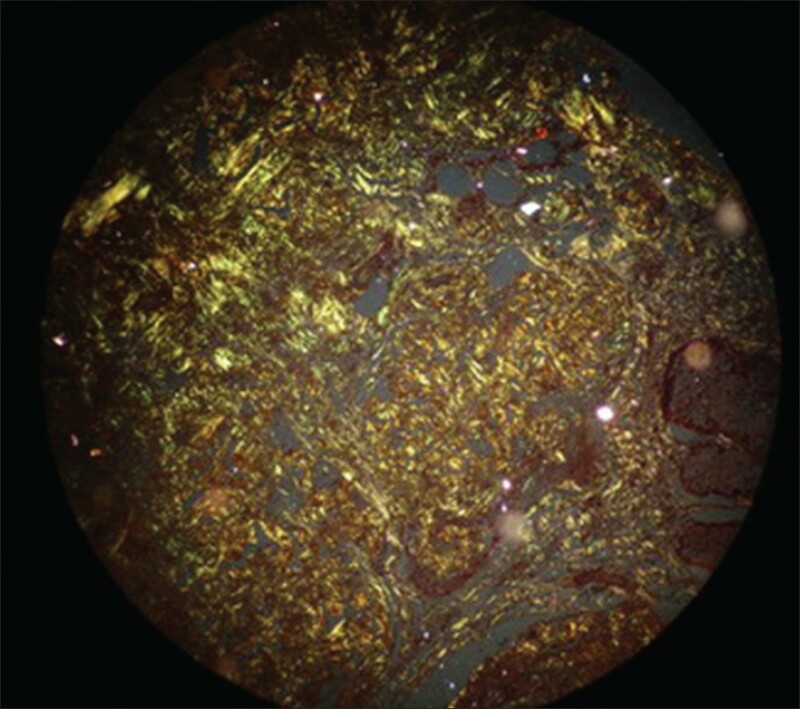 The patient was referred to a physician to rule out any other systemic feature of amyloidosis, after which a diagnosis of isolated conjunctival amyloidosis with tarsal involvement was made. Patient was treated with modified Wheeler's operation for entropion of the left lower lid. The entropion was corrected and patient was relieved of his symptoms. The patient was reluctant to undergo ptosis surgery as ptosis did not involve the visual axis. Amyloidosis of the conjunctiva is a rare entity. Various ocular structures maybe involved in systemic as well as localized amyloidosis. , Adnexal involvement that includes skin deposition is a part of a systemic disorder, until proved otherwise. The involvement that spares the skin is probably a localized disease. Conjunctival amyloidosis is loosely defined in the literature and seems to include various combinations of amyloidosis involving the conjunctiva, tarsal plate, orbicularis muscle, levator muscle, and Tenon's capsule. There has been little literary discussion on the management options and operative approaches for ptosis and entropion due to amyloidosis. Small localized lesions causing ptosis have been treated by en bloc resection, cryotherapy, and superficial cobalt therapy. , Advanced amyloid deposits can be treated by debulking the mass, preserving the anatomical planes of the eyelid and thus preserving normal eyelid tissues and preventing hemorrhagic sequelae. One of the characteristic features of amyloidosis is its tendency to bleed which was not seen in our case. 1. Daniel MA, Federick AJ, Dmitri TA, Evangelos SG, Susan MP, Nancy LR. Principles and Practice of ophthalmology. 2 nd ed. Philedelphia: W. B Saunders; 2000. p. 4636-53. 2. Demirci H, Shields CL, Eagle RC Jr, Shields JA. Conjunctival amyloidosis: Report of six cases and review of the literature. Surv Ophthalmol 2006;51:419-33. 3. Rodrigues G, Sanghvi V, Lala M. Conjunctival amyloidosis of both eyelids. Indian J Ophthalmol 2001;49:116-7. 4. Smith ME, Zimmerman LE. Amyloidosis of the eyelid and conjunctiva. Arch Ophthalmol 1966;75:42-51. 5. Hubbard AD, Brown A, Bonshek RE, Leatherbarrow B. Surgical management of primary localised conjunctival amyloidosis causing ptosis. Br J Ophthalmol 1995;79:707. 6. Bennhold H. Eine specifische amyloidfärbung mit kongorot, Münchener Medizinische Wochenschrift, 1922;44:1537.